LEWCO Aluminum Extrusion Transfer Conveyor - LEWCO Inc.
LEWCO provided a powered roller and transfer system to interface with a punch system. 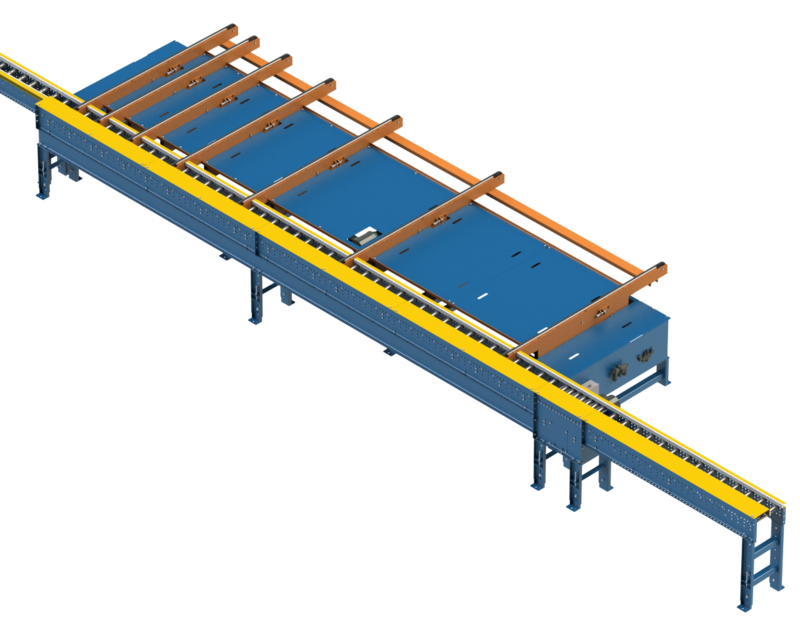 This conveyor is handling aluminum extrusions of various lengths. Some components needed to be transferred to the punch, and others had to bypass it. LEWCO built a multi-strand self-powered transfer with PowerTwist interlocking V-belts. The roller conveyor is line shaft driven with non-marking orange polyurethane sleeves on the rollers, and UHMWPE covered guide rails and stops. While moving the part to the saw the multi-strand transfer also served as a parts buffer, using indexing accumulation. The operator can choose to call for a part whenever they need a part, otherwise the parts index one at a time onto the transfer to feed the punch system. After the punch process there is a duplicate transfer sending the completed part to another powered roller conveyor running adjacent to the bypass conveyor. LEWCO designed and built the control system for this including set-up and testing at our plant prior to shipment. This reduced the time required for installation and commissioning.